Buried under so much zucchini you don’t know what to do with it? 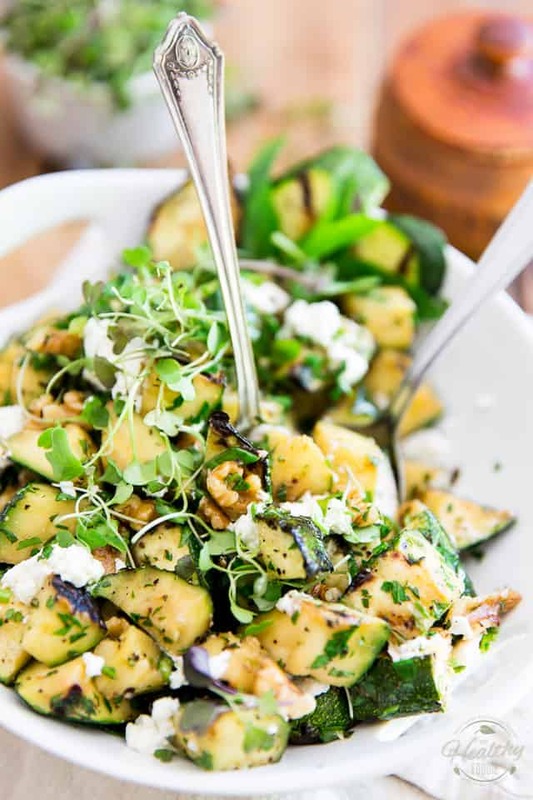 This Grilled Zucchini Salad sure is a different and tasty way to make good use of them! In fact, it’ll probably have you want to go out and get more! 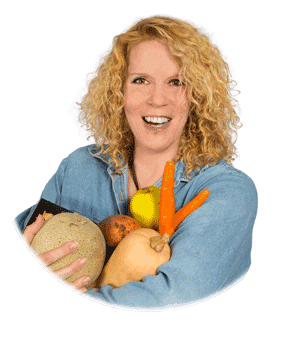 This time of year, zucchini seems to be everywhere and can usually be had for just a handful of pocket change… Even better, if you happen to have some in your garden, then your plants are probably producing WAY more than you can handle! 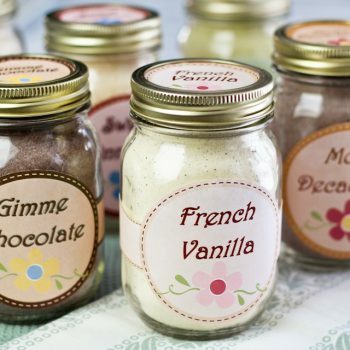 Well, if you’re searching for something different to do with all that zucchini, look no further! 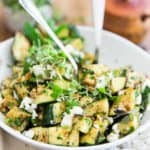 Delicious warm or cold, this Grilled Zucchini Salad is so tasty, you’ll almost be grateful to be stuck with all that zucchini, and will probably end up hitting the store to get more! 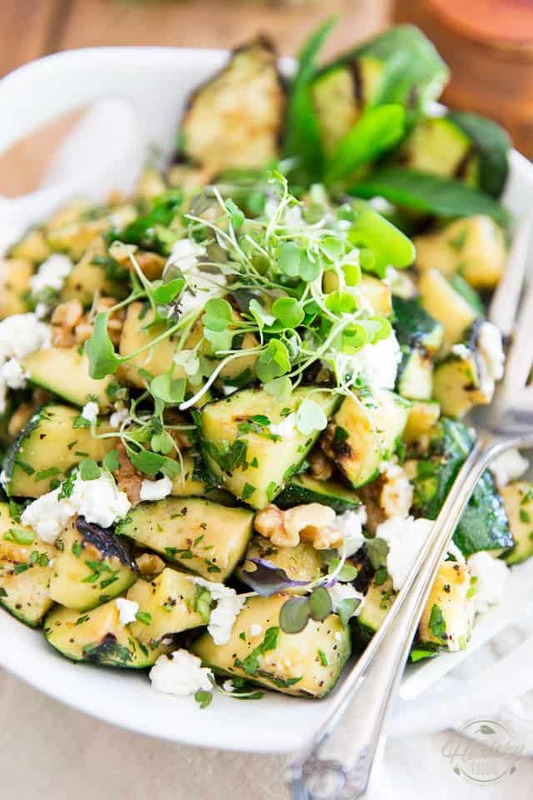 In this salad, the zucchini really has all the room to shine! 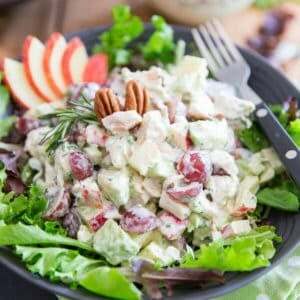 It gets complemented very humbly with a handful herbs, nuts and cheese, it’s soft and crunchy all at once, has nice little hints of smokiness from the grill, as well as a little bit of tangy creaminess thanks to the addition of soft goat cheese. But really, it’s zucchini at its best, and it’s so brilliant, I’m sure that even non fans will love it! Your first course of action should be to preheat your outdoor grill to high heat. 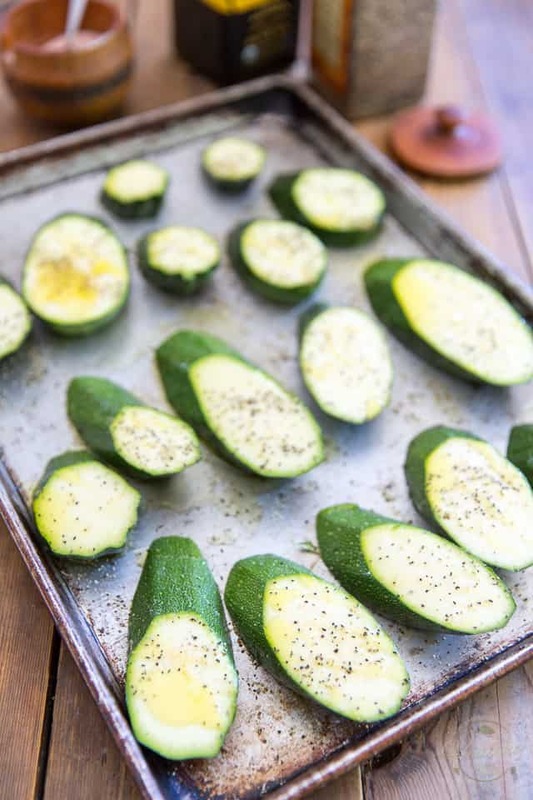 Once that’s done, you’ll want to trim off the ends of your zucchinis — use 3 to 4 medium-large ones — and cut them into 3/4″ thick diagonal slices. Drizzle the slices liberally with olive oil and sprinkle generously with salt and pepper on both sides. 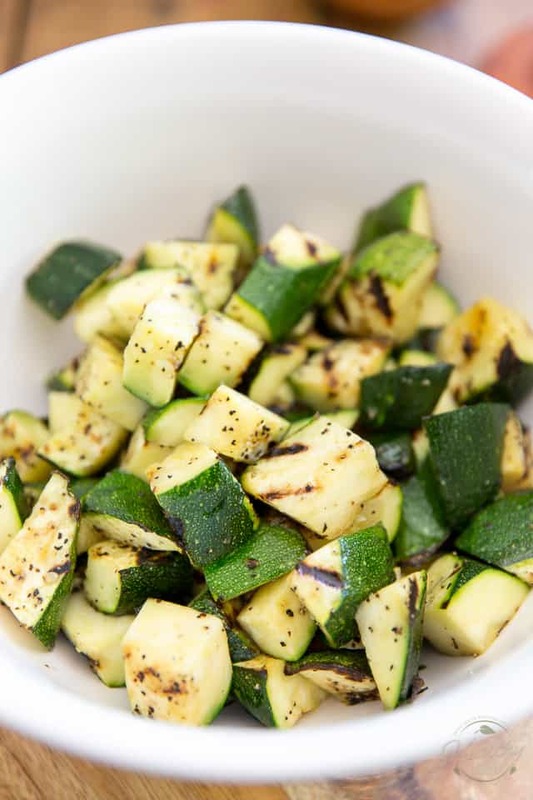 Grill the zucchini slices on both sides until slightly softened and nice grill marks form, about 2 minutes per side, then carefully remove the grilled slices to a large plate. 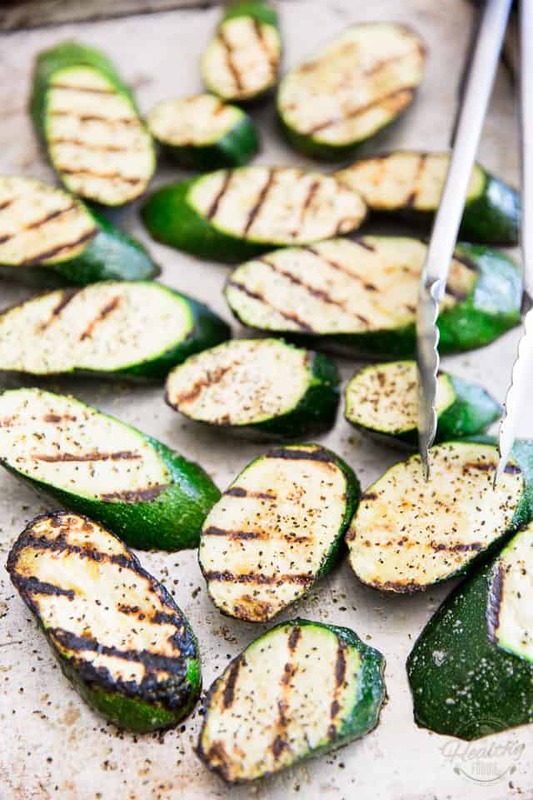 Let the grilled zucchini slices cool for a few minutes, until you can safely handle them with your bare hands and then cut them into bite size pieces and throw into a mixing bowl. 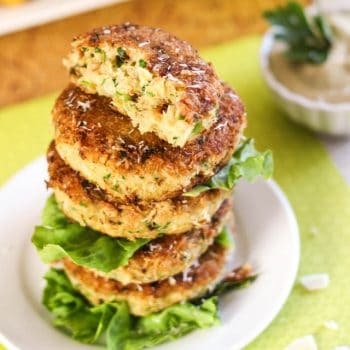 Add the chopped green onions, minced garlic, chopped walnuts, parsley, mint, salt and pepper to the bowl and toss gently to combine; adjust seasoning as needed. 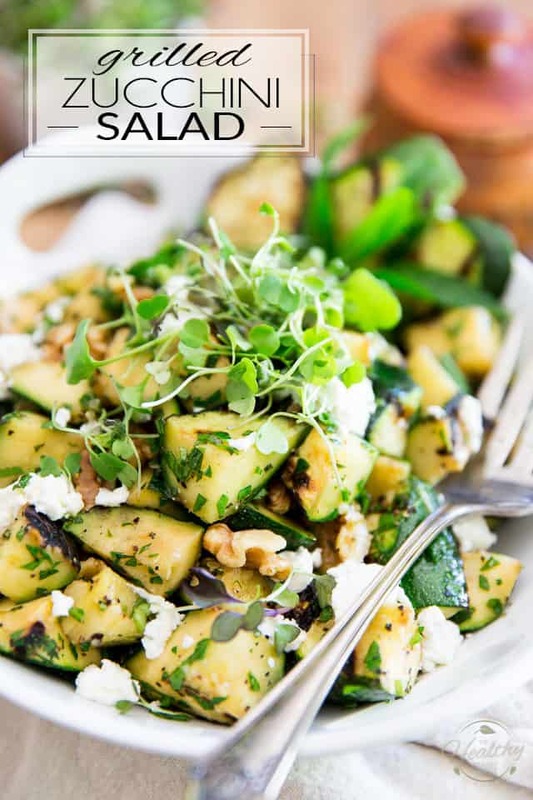 Transfer your salad to a serving plate and garnish it with the crumbled goat cheese. 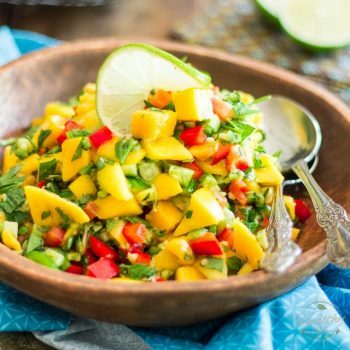 Since this salad is equally good warm or chilled, you can either serve it immediately, or put it in the fridge until ready to serve. Buried under so much zucchini you don't know what to do with it? 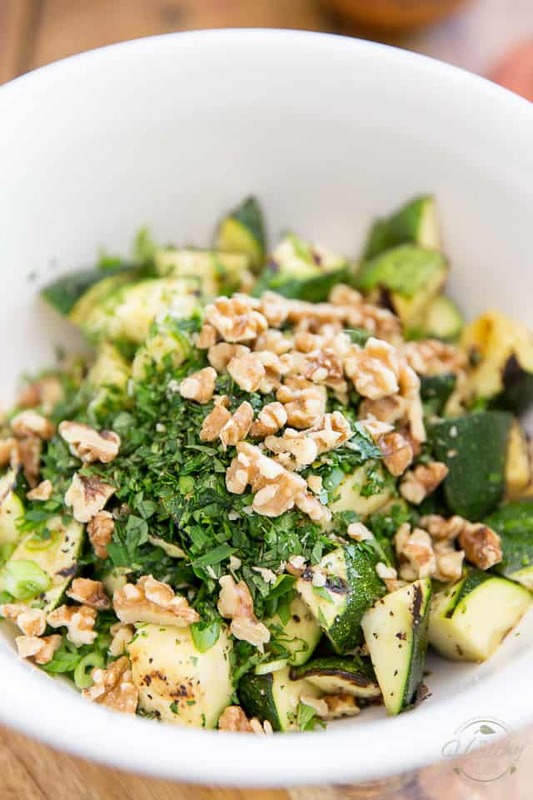 This Grilled Zucchini Salad sure is a different and tasty way to make good use of them! In fact, it'll probably have you want to go out and get more! Preheat your outdoor grill to high heat. Trim off the ends of the zucchinis and cut them into 3/4" thick diagonal slices. 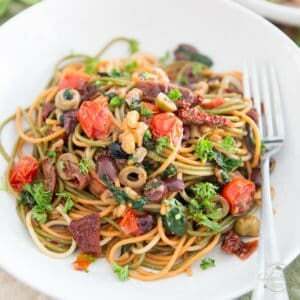 Drizzle liberally with olive oil and sprinkle generously with salt and pepper on both sides. 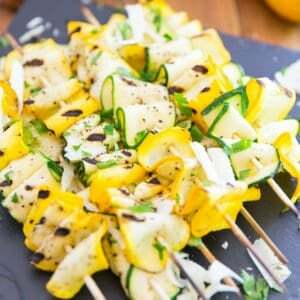 Grill the zucchini slices on both sides until slightly softened and nice grill marks form, about 2 minutes per side. 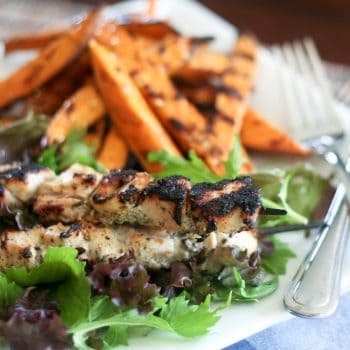 Carefully remove the grilled slices to a large plate and let them cool for a few minutes, until you can safely handle them with your bare hands; cut into bite size pieces and throw into a mixing bowl. 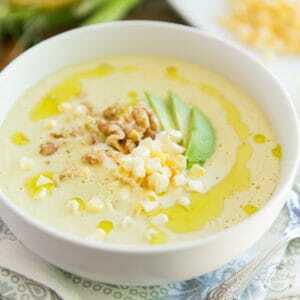 Add the green onions, garlic, chopped walnuts, parsley, mint, salt and pepper to the bowl and toss gently to combine. Adjust seasoning and transfer to a serving plate then garnish with crumbled goat cheese.